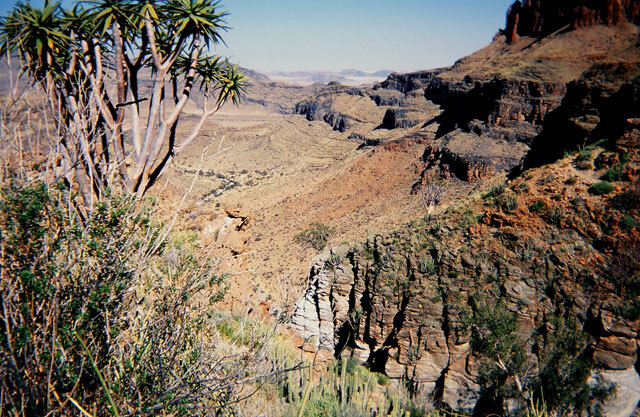 The eight-day, 120-kilometre (74.5-mile) Naukluft hiking trail is regarded as one of Africa’s toughest. I went along to find out why. After lunch at Fonteinkloof, much of the trail followed an easy zebra path along the ridge of the Elephant Skin Path, so named because of the shale it resembles. Then we tackled a tough climb up Heartbreak Pass, dotted with zebra carcasses, their demise a mystery. Once on the plateau, our reward was the yellow vistas of the Naukluft spreading to infinity, 300 metres below. Accommodation for the night was in a shelter of chest-high stonewalls and a gravel floor topped with an iron roof. Putte Shelter takes its name from the nearby well, equipped with a hand pump. We took turns collecting water before making supper. Lying in our sleeping bags later on, we picked out constellations from a star-studded sky. A cold wind blew throughout the night and we waited for the sun to rise before crawling out of our sleeping bags on the second day. 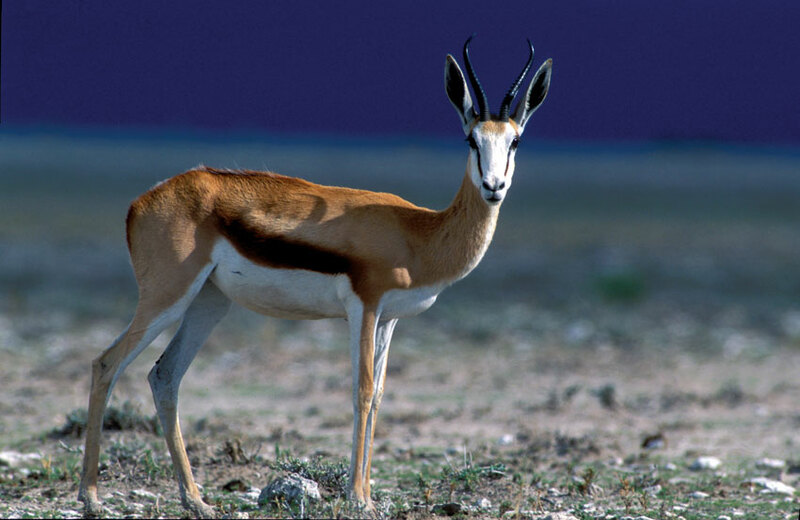 As we rounded a bend in the path, we startled a herd of klipspringer, and later saw zebra, this time alive, and two gemsbok with their magnificent vertical horns and black belly stripes. The trail was easy while traversing an undulating plateau to a disused well at Bergpos (Hill Point). Then we entered the spectacular Ubisis Kloof. About halfway we had to clamber, with the aid of chains, over enormous boulders, a scary experience with our backpacks throwing us off-balance. Just before arriving at camp, we followed fresh leopard spoor, most exciting. Could this be the cause of the zebra skeletons? It was a long walk to the end of the ravine and by the time we reached our overnight house complete with mattresses, cold showers and running water, we were exhausted. A cold wind blew on the third day as we retraced our steps along the ravine. After the chains we were able to appreciate the Namaqua figs, their roots spreading like tendrils over impenetrable rock in search of moisture and support. We also spotted the baobab-like phantom trees, possibly named thus because their white bark looks ghostly in the moonlight. The rest of the day was easy, crossing the Kudu Plains to our overnight shelter at Adelhorst. This was our worst night, as the temperature had plummeted by the time we crawled into our beds for an early night. A stiff climb on the fourth morning helped to thaw aching bodies. We then followed the beautiful Zebra Ravine, carved by the Tsams River, snaking through a steep-sided valley lined with fig trees. Next was a knee-wrenching climb up a scree slope, bypassing a waterfall before winding down to the river once again. High above, a troop of baboons had fun scattering us with rocks. A short detour to the top of the waterfall was a welcome place for lunch and a swim. We passed a number of springs before reaching the campsite at Tsams Ost Shelter and the halfway point of the trail. It was here, in September 1894, that after several battles a treaty was signed between Germans and the local Khoikhoi. Day five started with an arduous three-hour climb to Broekskeur, followed by undulating terrain in the Euphorbia Ravine. From here it’s a short climb to Quiver Tree Ridge, named after the trees from which locals carve containers for their bows and arrows. Some of us hiked to the end of the ravine and the enormous dry waterfall. 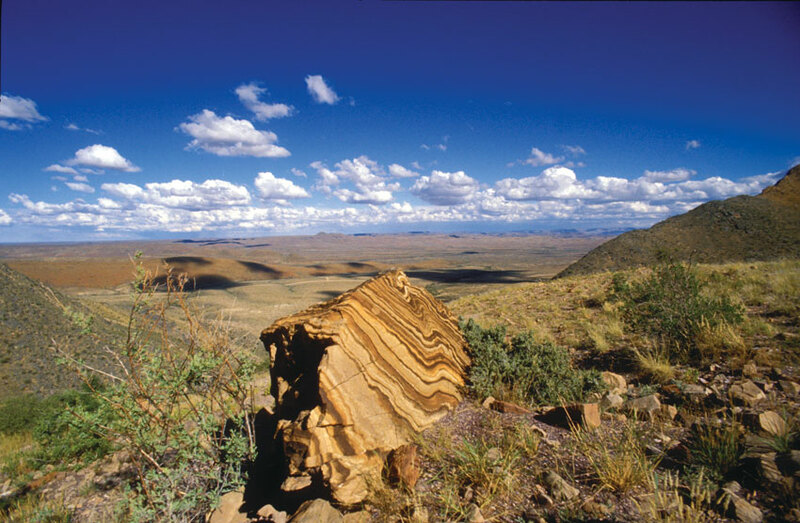 The Naukluft Mountains form part of the catchment area of the Tsauchab and Tsondab, rivers that drain to the west after forging their way through the dune belt, ending in the clay pans of Sossusvlei and Tsondabvlei respectively. The sixth day had the steepest ascent on the trail, Groot Hartseer (Big Heartbreak) in store for us. After a steep climb out of the ravine, our reward was a swim through three magnificent pools to the top of a 100-metre (328-foot) waterfall, with spectacular views across the valley. From here the path twisted and turned through a narrow gorge, ending at the rosy-coloured quartz Arbeid Adelt valley. Gaining altitude gradually, we reached Tufa Tavern, a huge cave next to an enormous fig tree. Namibia is geologically fascinating. The porous limestone deposit known as ‘tufa’ is found throughout the park. These caves and pools were formed thousands of years ago when calcium carbonate-rich water evaporated through filters of dolomite rock, a process that continues today. Our long, tiring day ended with a walk across a valley. Weary, I sauntered off on my own, enjoying the remoteness and tranquillity. A Cape hare suddenly crossed my path, and on its heels, a bat-eared fox. We decided to combine day seven and eight, which started out like scenes from a cigarette commercial. After climbing up, over and around huge boulders covered in creepers and roots, we found ourselves below a 28-metre (92-foot) waterfall with a chain to one side. By now we were experienced climbers and with our lighter packs, soon scrambled up the sheer rock face. At the top of the gorge we reached World’s View and what a stupendous view it was! A little further was the highest point on the trail, Bakenkop (Beacon Head) at 1 980 metres (6 494 feet) on a rough and rocky path amongst limestone and quartz. We then wound our way across Kapokvlakte, named after the woolly cotton plants growing here, to a hut of the same name. After lunch we traversed the Never Ending Hills and a rocky watershed covered in yellow daisies. At last came our final descent into a dry riverbed joining the Waterkloof day trail, with many crystal pools. A refreshing swim ended this exciting trail. Exhausted and weary yet happy, we agreed that the Naukluft trail was one of the best in the world, especially for hikers looking for excitement and a real hiking challenge. Fitness: Hikers need to be very fit! When making your booking, you must present a recent medical report attesting to your fitness. Getting there: Take the D854 for 10 kilometres driving south west to the C14, the road linking Solitaire and Maltahöhe. From here it is a further 92 kilometres to the park. From Windhoek, pass Bullsport, turn right onto the D854 and then right again onto the sign-posted road to the park entrance. Day 1 – Starting at the main Campsite, an easy 14km hike with only two fairly steep ascents. You are rewarded with magnificent views of the valley some 300m below. A shower awaits you at the overnight shelter at Putte, after a relatively easy six-hour hike. Day 2 – 15Km of mainly undulating ground. You descend into Ubusis kloof where chains have been anchored in the rock where negotiation would otherwise be difficult. 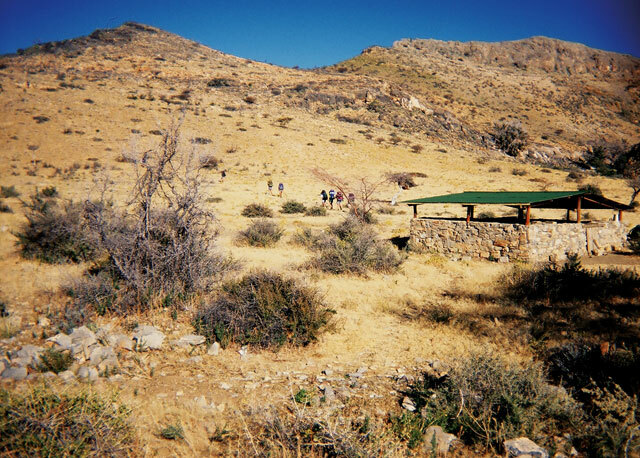 At the end of a six-hour hike, you may be surprised by the Ubusis shelter, which used to be a holiday cottage. Day 3 – After backtracking to ‘Bergpos’, the day’s hike is a comfortable 12km across the plateau. The chances of spotting Kudu and Zebra are very good. Four to six hours hiking brings you to the Adlerhorst shelter. Day 5 – 17Km which should take six to seven hours take you up an initial steep ascent up ‘Broekskeur’ after which the trail meanders through patches of euphorbias and quiver-trees. Water bottles can be replenished at ‘Fonteinpomp’, which is about one third of the way to Die Valle shelter. Day 6 – Climbing steeply, the trail brings you to the top of the ‘Die Valle’ waterfall which is some 200m high. Although normally dry, it is still a magnificent sight. A total of 16km in about six hours’ hiking gets you to the Tufa shelter for the night. Day 7 – A steep ascent up a well-vegetated kloof presents another waterfall which is scaled with the help of chains. Today you reach ‘Bakenkop’, the highest point on the trail from where you look down at the Tsondap river valley 600m below. A five hour hike over 14km brings you to the Kapokvlakte shelter. Day 8 – The final 16km should take about five hours hiking, culminating in crystal clear pools about 40 minutes away from the end. No doubt you will enjoy a swim at this stage. This also forms part of the day trail, and returns you to the campsite where you started. Note –Days 7 and 8 can be combined. This should only be attempted by extremely fit hikers. This article appeared in the Feb/March ‘06 edition of Travel News Namibia. What is the best time to do the Naukluft Hike is May a good time? What is the rate and parkfees p.p please? Three of us are doing the Naukluft on the 2 September. I think it is the wrong time to do the trial, maybe to hot? Mid July to mid Aug is a better option? I came across your article in search of some information on the Naukluft Trail and a travel companion (minimum of three hikers required) who likes to join me and my wife in May 2018 to hike the 8 days trek. We are still looking for someone who wants to hike with us or a group we can join to be able to start the hike. Maybe someone knows someone who likes to join us and spend some adventurous days in the Naukluft mountains. We (my wife and our girl (11)) like to do the the trail, start on the 3. of may. Who wants to join? We are moutaineers from Switzerland. are you still wanting someone to join the 8 day hike in May?